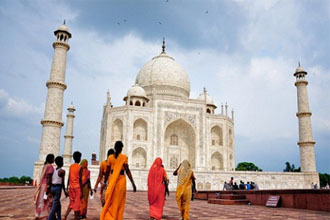 This private guided tour is especially designed to make you explore the fabulous sites in Agra, staying relaxed. This tour gives you an opportunity to view the wonder of the world, “The Taj Mahal” at sunrise and sunset time from two different locations. Visit to Agra Fort and Itmad-ud-daula is an add-on experience. Pickup from Airport / Hotel in Delhi. You will be driven to Agra via Yamuna expressway. Reach Agra and check-in to the hotel post lunch. After lunch proceed for a private guided tour of tomb of Itmad-ud-daula ( baby taj ) & Mehtab Bagh for sunset view of Taj Mahal. Early morning leave for a private guided tour of Taj Mahal for it’s sunrise view. After the visit to Taj Mahal have your breakfast at the hotel. Afterwards checkout and visit Agra Fort. Later explore bit of local arts and crafts. Post lunch leave for Delhi through Yamuna Express Highway. Transfer To Delhi Airport / Hotel. Excursion of Fatehpur sikri with english speaking guide can be added to the itinerary with addtional cost of USD 50 in total.